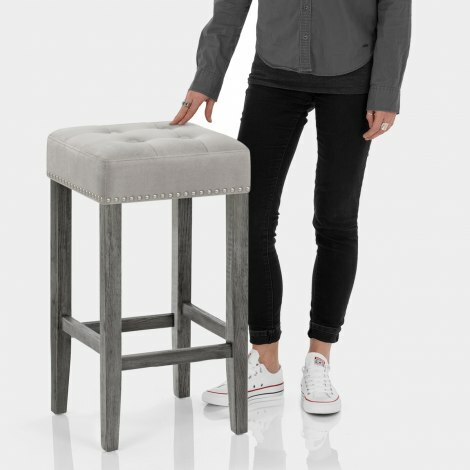 A delightful fixed height design, the Dove Bar Stool Grey Velvet will make an elegant addition to your bar area. Effortlessly combining practical features and opulent styling, the Dove is set to become a firm favourite amongst you and your guests. Sophistication unites with compact style in this backless design. Boasting a padded grey velvet seat, it also features button and stitch detailing for class and beauty. What’s more, the seat is edged with metallic studs for additional allure. A frame of four solid wooden legs forms a strong base for the stool, and is enriched with a grey finish that adds modern style. Providing a footrest at each side, the legs are connected by sturdy bracing bars, whilst protective plugs are included to help keep your floors in great condition. "We are really happy with the product"
Very happy with the bar stool. Exactly how it was stated. Lovely bar stools, comfy to sit on, easy to assemble and they look fab. Dove Bar Stools- love these! Love these! Much nicer that I thought they would be. Very easy to assemble. Assembled easily. Reasonably priced. Stools look great. Perfect height to kitchen island. We are really happy with the product and delivery time.